Auction Closed. Sold via Buy Now $800. Next Auction Monday, Feb 5. I spotted this view in Rochester last week, from the north on Rt 100 along the White River. When it comes to art (and life, I suppose) that’s very often the challenge. It’s always a thrill and a happy surprise, when things come together in the end. 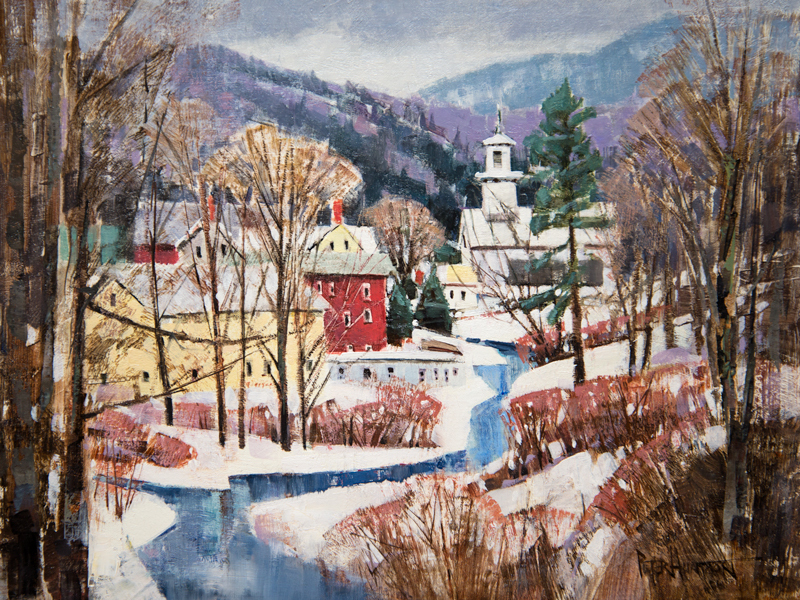 I absolutely love this painting – the idyllic beauty of Vermont so lovingly expressed in the colors we are so privileged to see each day! Gorgeous! 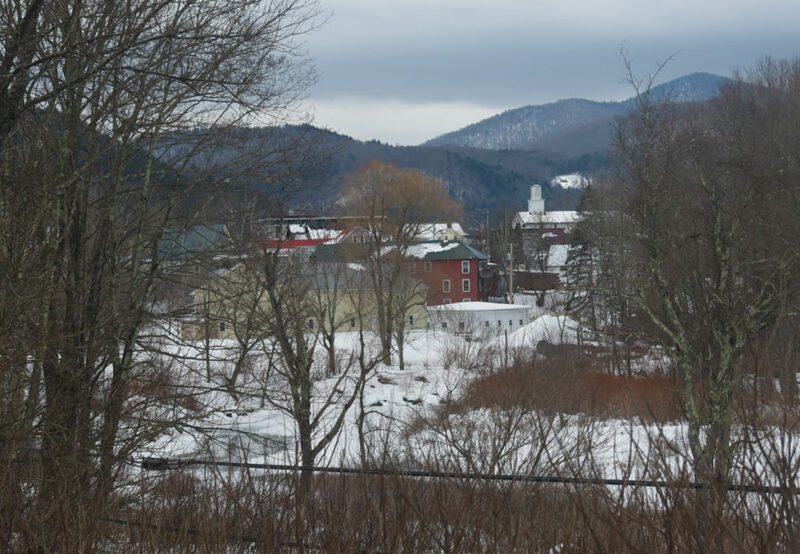 You’ve captured the quintessential essence of winter in Vermont so perfectly! I may have to get a print of this one:). All of your paintings are painted with a unique style that no one else can duplicate. I love your work. I look forward to seeing what you do each week! We’ve spent the last 35 years in Rochester. I’d love to have this on my wall!! One of my favorites, Peter! 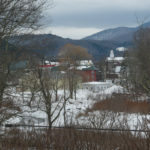 The combination of warmth shown in a cold townscape is what Vermont is all about! Very meaningful accompanying statements……and framed beauty. Very special! Love the colors and organization of “stuff” as you call it. We always enjoy your interpretations! Love the colors, love the interesting angles, and it’s so Vermont! Nice job. This is such a wonderful piece. I love traveling down back roads and finding villages along the rivers. I feel like I could just walk into the scene and find the calm, within the village. 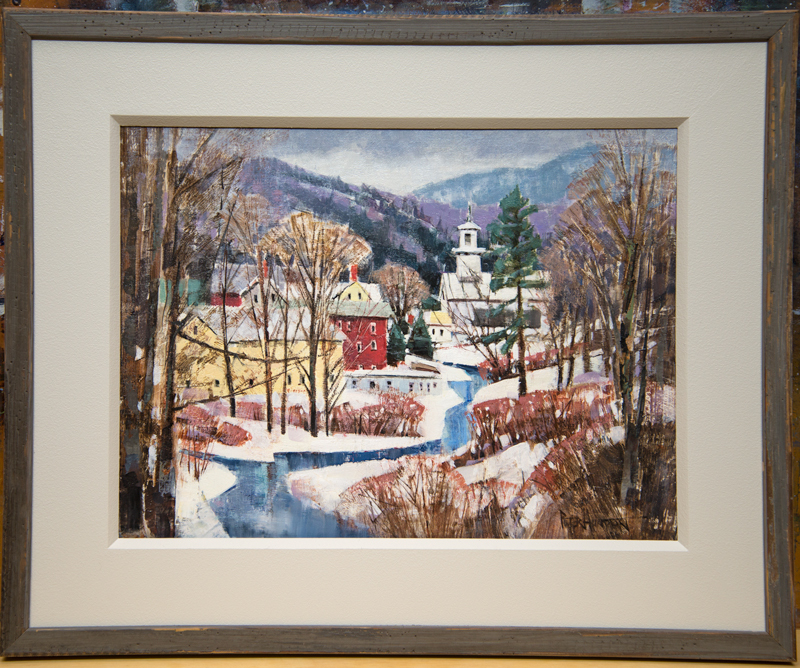 The open water meandering through the village scene is perfection! Beautifully done! Oh, what a romantic valley. Lovely “stuff”. Why anyone should leave this place for living in an ugly big city? Sometimes life kicks us out and we are travelling and working around the world. But deep in the heart there is a strong longing for places like Rochester. I love the almost abstract rendering of this scene, and how you turned a dull day photo into a beautiful lovely scene. You nailed it! The calm, beauty of old country. It makes me want to be there..be a part of that beauty! A wonderful painting of a truly wonderful place! My husband was born here and we have spent all of our 54 years of married life in this beautiful and unique place. One of my aunts lived on a hill overlooking the town!! I remember the view was magnificent!! Thanks for doing this picture!! Love your last sentence, to simplify – so important I’m learning. Especially for beginners like myself. Very beautiful! 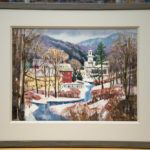 I love the way you find and capture the beauty of Vermont! Thank you Peter! What I see when I think of Vermont! What I love most about the arts is the journey. It begins with inspiration. Then, whether it be painting, sculpture, music, dance, or any other creative art, there is always the same wonderful path to follow of starts and stops, edits and embellishments, de-emphasis here, addition of highlights there, until the essence of beauty and harmony shine forth. Beautiful job, Peter! Thanks Brian, yes, that creative path is not always easy, or pretty, but it’s always worth the trouble once you emerge from the pucker brush on the other side. Jumble is a perfect discription, but the infusion of utter beauty has been so perfectly captured. I love it! Thank you for sharing your talent with all of us!